Beading Blog - thebroadroom.net: What to make next? Did a little clothes shopping today, went to Target...got some of that Proenza Schouler stuff. I haven't been following their guest-designers project too closely but it was marked half off and looked pretty decent. Last summer I got some of those Mossimo tee shirts and tank tops; frankly I'm not that happy with them. I don't think some of them are going to last a full year. So I'm game to try something new. Not something I'd normally buy, but I need an inexpensive black summer dress which is machine washable. 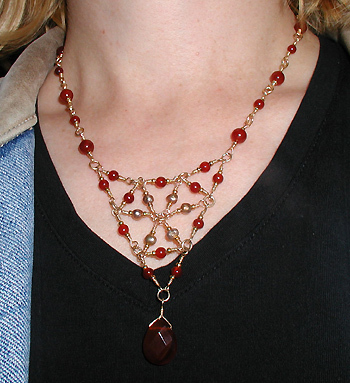 For a long time I was thinking of doing something similar (with better workmanship of course) with crystals instead of the carnelian beads and pearls. Not so much the triangular shape, rather the idea of creating "fabric" for the necklace out of wrapped bead links. ...only with smaller pearls. I still have a set of filigree cones I could use for the back.